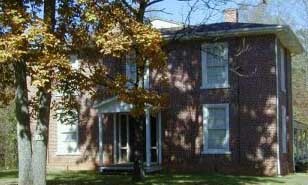 Richmond Hill Law School in what became Yadkin County was established about 1846 by Judge (later Chief Justice) Richmond M. Pearson, who had conducted an earlier school in nearby Mocksville. Until Pearson's death in 1878, the school was one of the preeminent law schools in the state, its only true rival being Judge William Horn Battle's school in Chapel Hill. Instruction at Richmond Hill was offered both to students studying for their county court licenses and to more advanced students preparing for practice in the superior courts. The mode of instruction was rigorously Socratic, involving intensive discussion of both the law and its underlying principles. Pearson himself claimed to have instructed "more than a thousand law students" at Mocksville and Richmond Hill, many of whom achieved distinction in the legal and political life of North Carolina and the nation. Wilson Angley, Richmond M. Pearson and the Richmond Hill Law School (1978). Fannie M. Farmer, "Legal Education in North Carolina, 1820-1860," NCHR 28 (July 1951). Council S. Wooten, "A Famous Old Time North Carolina Law School," North Carolina Journal of Law 2 (1905). Richmond Law School Building, built ca. 1861. Courtesy of NC ECHO. Available from http://www.inst.ncecho.org/PhotoDetail.aspx?siteno=00773&photono=002 (accessed November 7, 2012). Richmond Pearson, judge, established the Richmond Hill Law School. Image courtesy of North Carolina State Archives. Available from http://www.ncmarkers.com/Markers.aspx?ct=ddl&sp=search&k=Markers&sv=M-12%20-%20RICHMOND%20PEARSON%201805-1878 (accessed November 7, 2012). Is this just a lovely famous historical structure or is there actually a law school located somewhere in 'yadkin county' with classes to begin, etc....? Thanks for visiting NCpedia and taking a minute to comment and ask your question. Richmond Hill School is an historic structure and site. Today the school is the restored site of Pearson's home and school, but no longer an operating school. Here is the website of the Yadkin County Chamber of Commerce with some information about the site's hours and visiting -- http://www.yadkinchamber.org/visitorinfo.html.